Just a 2 0 minute ride from Ambergris Divers and up the coast of North Ambergris Caye. 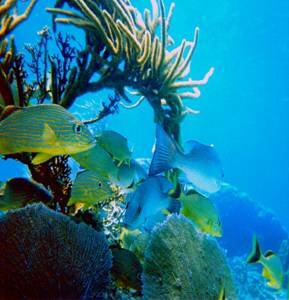 Mexico Rocks is a superb Patch Reef, which lies half way between the reef and shore. 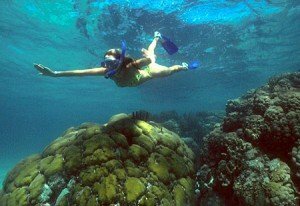 The charm of the site will further be enhanced by the amiable and professional attention by our Snorkel Guides as they not only assist in your comfort and safety, but are also happy to share about the sights making your experience informative, and relaxing. Mexico Rocks 12ft depth offers excellent visibility of the opulent collection of Boulder Coral dotted by Star, Elk Horn and Stag Horn Coral. The large Boulder Coral rise 10-12 ft high nearly touching the surface and providing refuge to a variety of marine life, including lame scallops, anemones, tube worm shrimp, and eels sheltered in the coral’s nooks and crannies. Sea fans, azure vase sponges, and butterfly fish add life and color as well. Giant Brain Coral formations create miniature under sea habitats and islands for Spiny Lobster and Yellow Tail. $55.00 usd per person. $10us/px park fee upon check-in.